Crescentia finished another base CG, so all that's left to do on the CG scenes is finishing the last CG scene on Saturday's live stream. After that there might be some polishing left to do on the CG scenes, but the major amount of the work has been taken care off. Boxman also made some great progress on the tileset, as you can see in the picture above. While Blade and Zhuan made some progress in their respective fields (programming and writing). Technically, today the 2 week mark is reached, but we figured to include all the optional goals from our optional goal list. As I mentioned in previous posts, it's only mandatory for Cres to return to her work on Deathblight RPG, since noone else has work to do with that one. And since that works out as planned, it's no problem to let the rest of the team work on the "2 week game project" for a couple more days. Since the brunt of the work is done, I won't be writing progress reports every two days from now on. But you'll certainly see at least 2 progress reports before we release the game. I hope you're looking forward to those! Yeah, no daily live streams anymore. 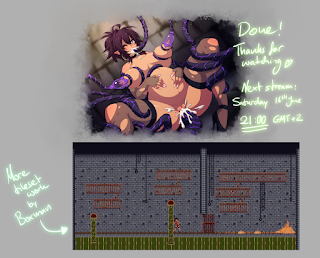 Next live stream is on Saturday 21:00 GMT+2 like usual. There's only Francesca's rival in the game, but you don't get to fight her.